This serum has an enveloping texture which instantly reshapes redefines and protects the facial contours, and smoothes the decolleté from 25 years. This serum has an enveloping texture which instantly reshapes redefines and protects the facial contours, and smoothes the decolleté from the age of 25. Scent: Floral, fruity, musky. Proven efficiency from 1 month: 88% satisfaction* for lifting effect and 84% satisfaction* for refining effect. After 2 months: 100% satisfaction** for smoothing effect on the décolleté. *Self-evaluation carried out on 19 people who applied Perfect shape youth serum twice a day for one month. **Self-evaluation carried out on 17 people who applied Perfect shape youth serum twice a day for two months. Man­ioc sugar - 3D elastic film on the skin surface for an immediate lift effect. Bi­ga­rade flower ex­tract - To unclog fat tissue. Ma­rine oligosac­cha­rides - A genuine molecular trap to stop the fat-storage processes and stimulate lipolysis. Pep­tides M3.0 - To boost collagen synthesis, guarantee an effective and long-lasting dermal structure, and lift the face and restore texture and tone. 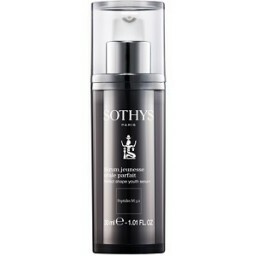 Apply morning and evening from the cheeks to the décolleté using the Sothys specific smoothing technique for optimised results. Follow with a suitable skincare cream.